He felt a sudden sense of protectiveness towards Shailputri (The daughter of the mountains), who smiled at her father. There is an invisible chord which connects the coldest of a father's heart, hidden beneath the layers of practical hardness, so coherent to the idea being a man. The sun beamed merrily with moderate intensity at the beautiful girl. She was a tall girl, with a majestic glimmer of intellect reflecting through her dark, big eyes. Himalaya was always amused by those eyes which spoke to him even when he held her as a two month old. She would fasten them to his eyes and he would look into them as if he were a man whose salvation lay there. She smiled and the smile touched the corner of those eyes. Her father smiled back. She walked to her father, who wrapped his strong, able arms around her shoulders. They walked across the hill in silence as their hearts spoke. She knew her father would every morning walk the serpentine road to the cliff and would watch the Sun rising from there, lost in his thoughts. She didn't know how God looked, but as she would watch his thoughtful, tall figure walk, with his hands locked behind and an immense nobility wrapped around his being- She would believe that Gods must be much like her father. She grew up watching him going up. Today, they walked to the cliff together. It meant many things to her. It meant her own graduation into wisdom acknowledged by her father, it meant a definite camaraderie with the first Hero of her life. They stood at the cliff and looked at the valley beneath. The greens mingled with the blue on the edges and then lost its character in ambush between the orange of the benign sun, blue of the sky, the dark remnant of the passing night and the multiple shades of green. There were houses there which stood on the bank of blue river which looked like lines of fate from there. She knew there were men there, but father always told her that they were beneath her. She should not waste her intellect to even spare a thought for them. She wanted to believe him, but. She had seen few months back a man walking very fast towards the higher mountains. He had purpose in his walk. He did not look around to watch the immense beauty of the mountain. He was a very handsome man with a dark texture of skin which told her that he was from the planes. He walked alone through green bushes and wore lion-skin as his cloth. It barely covered him, but he, unlike the plains-folk she had seen and even unlike, their own mountain people, was untouched by the cold which blanketed the mountains. He seemed as if he was carrying some intense, angry fire in his being which pushed the cold away. He held a Trident in his arm and it seemed less like a weapon, rather like an extension of that broad and immense arms, which seemed to hold enough strength in them to even stop the flow of time, should it so desire. He looked at her once with those eyes which seemed well-settled beneath those upturned brows. Was it scorn, or grimace or a smile which those eyes held for her, she couldn't make out? She was lost in discovering if she meant anything for those eyes. His vision floated over her as if she didn't exist and was merely a part of the forest in which she stood. She felt she belonged to him and his glance was an act of establishing ownership. She felt that all she could do was to surrender her being to the all-encompassing feeling. She had asked her mate for the name of that man and she told her that he was Shiva. He was the one great man from the plains, who annoyed by the pettiness of Gods, fighting among themselves had retreated to the mountains. The friends of her mate, who were in touch with plain-people told her this much. She also told her that Shiva had lost her eternal companion, Sati, to the stupid societal regulations which not only brought great calamity to humankind, left this noble soul, alone. They also told her that this man, thought of unimaginable greatness, was known to live with a rage, which was death incarnate. Most men kept off him. Shailputri felt her heart pulling her towards that wanderer who did not look at her. She felt at that moment as if Sati breathed inside her. As she stood there with her father, looking at the world beneath them spreading out in its glory, she muttered,"Shiva" slowly as if throwing it out with a sense of experimentation, as if trying to find out the taste of that name in her mouth. The word filled her mouth and her being with something which transformed her from being a mere girl. Her father, shocked at the sound of the word, suddenly pulled her away from himself and looked at her face. He almost hissed," What did you just say?" "Shiva" she basked in the divine sound of that name. "From where did you find this name." She paused. Her father held hard to his shattering hope. "I love him, father. I will marry him." Himalaya felt so weak suddenly. His arrogant pride seemed to hold him so tight around his neck that he almost couldn't speak. He struggled hard to gain his voice and with all the hardness of voice which he could summon," He isn't for you to have. He is not one of us." The arrogance melted into a humiliating appeal by the time the sentence ended. "You are mistaken father. I am a woman and I can hear my heart. A woman's heart can not lie to her. I am not seeking something which isn't mine. He is mine and he has been one with me at one point of time." "He is a man lost in his purgatory, my daughter. He lost his wife in old times and he lives with a grief which has turned him almost inhuman." "Father, there is no such grief which love can not surmount. I have that love for him, which transcends time. I am the companion, whose loss he laments. Drowning in his sorrow, his vision is clouded. He is not able to recognize me. His troubled soul has no resolution but me and sadly, he, the omniscient, doesn't know that. It is not right for any man to pass through life as if he were passing through death. A man of capability is entitled to the greatest of love." "I do not know what you are talking about, my child. If you had chosen any man of plains, a mere mortal, I would have tried to stop you. You have chosen the highest divinity for yourself. I know, the journey to reach to him would be difficult, and I fear, even impossible. I can not let you gamble your promising life for a love which today even doesn't exist." "Father, I have uttered his name with all the purity of my soul. I have to go to his abode. I will serve him, take care of him. There will come a day when he will recognize me. I will burn my soul in his love and be one day worthy of him. In love, we conquer by first surrendering the self. Through ashes this greatest of all human blessings rises." Himalaya's heart broke and his pain rose from his throat to his eyes from where it found its way as tears. His daughter, his kid, has found love and where has she found it was so unattainable. He held her in his embrace and wrapped his long arms around her as if to protect and insulate her for this insanity. He knew he had to try but he also knew he would fail. His daughter would travel to the high mountains where her love was cleansing his soul in a very private grief. She would walk to the mountains where winds colder than the cold past of her beloved bellowed through the unfeeling ice. As he sat in silence, she would cook for him, take care of him. His cold heart would one day warm up to hers, she knew that. She reached there, bidding farewell to her father. Shiva, meditating, next to a frozen lake, opened his eyes and looked at her with a blatant annoyance. Those blue eyes seemed at that moment like blue flames. She sat near him, not very close, a little away. She cooked for him. The winds raged as if in defiance of the love which she brought. Her faith, her love, stood firm as she held her arms against the winds and set fire to cook. She cooked and placed it in front of Shiva, who opened his eyes and had his food in silence. Finishing his food, he would go back into his reverie and ignore her existence. The sun would rise at her, with distinct sadness day after day and the night would sleep into a hopeless dream every evening. She coughed and shivered through the hailstorms but keep cooking. She thought of the loneliness that she had left for Shiva by leaving him alone as Sati in earlier birth. She knew this was her penance. She kept thinking of what if she had not argued to visit her parents. She kept thinking of the nobility of this man who has become a cold, unfeeling monument of failed love, who respecting her rights as a woman, allowed her to go. She thought and thought until she was numb with the guilt and pain. It was sixteen weeks since she was there and the night had befallen that Monday with unforeseen cruelty on already crushed earth. The wind was blowing with unprecedented monstrosity and the tumult in her heart and thoughts grew with the night. She fell on the ice and shivered with pain. She clenched her fists and tightly held to her chattering teeth so as to not call her beloved's name in this moment of weakness. She could barely look at the lithe, strong body spread across the platform covered with ice and held against the rough rock at the back. She sighed at the sight of the divine dignity of pain of a failed love. As the night slipped into weakening darkness, she lost her control as incoherent thoughts would wreak havoc. She longed to be held in those strong arms and break down. 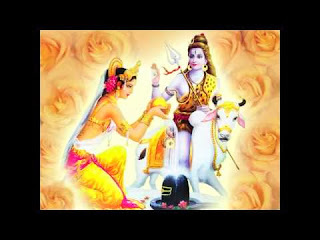 Shiva looked at the pathetic woman who lied limply there. She was almost a skeleton, though her beauty had a sense of timelessness about it which survived all the hardships of the days and depressing darkness of all the nights. She was dying and a wail rose abruptly from Shiva's heart which danced in the lonely mountain to the beat of his Damroo moving in the winds which seemed to have lost its mind. He had lost her once, he could not lose her again. She was not a woman there, it was her love which somehow had survived centuries. He thought of the fire of worship in which Sati had ended her life and in his closed eyes he could still see that loving face of their common future being charred to ashes. He opened his eyes and looked at the numb face which seemed so similar to the one he had lost to the fire. He walked to Shailputri and lifted her in his arms. A sudden music filled the mountains and a new life breathed in the limp body. Shailputri opened her eyes and a weak smile, drowned in the longing of centuries rose from her face. It caressed the rugged, tired cheeks of warrior-god who stared at her. The night ashamed at its darkness in that moment of glory of a great love, gave way to the orange sun of the morning, in whose light the icy mountain cliffs reflected the rare beauty of love. A tall man on the lower mountains, standing alone at the cliff, saw the reflections in the mountain above and breathed in a satisfaction which he had long forgotten. He closed his eyes and thought of the little girl, who once smiled at him with a toothless grin. Thanks, Wayne, for the visit and comment. To mythology is a lesson in living and we need to humanize it to understand it well. Last time i tried to comment on another blog but failed to post. Trying again.The story picked as per the rush of festival and depicts the innermost senses of human-being that joins the chord between a father and a daughter. The presentation is awesome and and the flow of story telling is beautiful. Thank you for sharing a profound story.